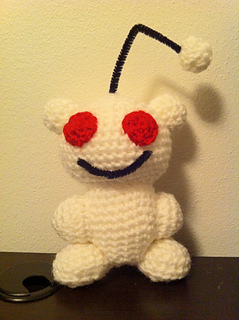 This is Reddit’s mascot, Snoo. I made him for my current Yarn giftee and thought I’d share the pattern. This pattern can be made using any weight yarn and size hook. I used a size 5.5 mm hook (I) and Red Heart Super Saver yarn, this pattern used less than half of a skein.